Last month was the hottest July on record in the US. While that might be bad news for crops, it’s good news for people who don’t want summer grilling season to end anytime soon. 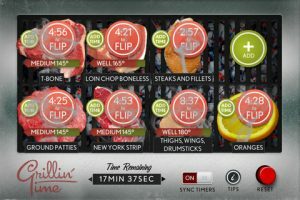 With plenty of time left to enjoy outdoor cooking all across the US, it’s high time to check outGrillin’ Time for iPhone, developed by Grit Design. Grillin’ Time is an astonishingly, mouthwateringly beautiful app. 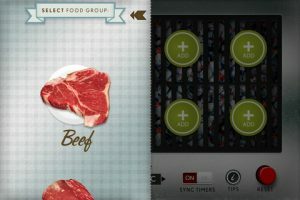 The overall design and UI is extremely high quality, with special praise for the realistic depictions of meat, fish, and fruit. In addition to being easy on the eyes, Grillin’ Time is also easy to use. 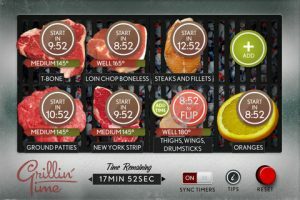 Granted, it does take a while to scroll through the various menus to select your protein, weight, thickness, and how you want it cooked, but the menus are well-designed and easy to navigate. 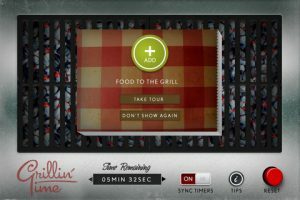 Now, if you have a temperamental grill, the times may be slightly off. However, the Grillin’ Time app estimates are generally very good, and can be customized for different recipes. 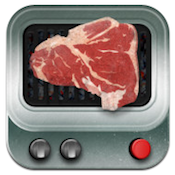 With the ability to track 8 different grillables at once, a database of 375 different food items, and a sync timer that ensures all your food will be ready at the same time, casual grillers and block party organizers alike need to have this iPhone app in their cooking arsenal. 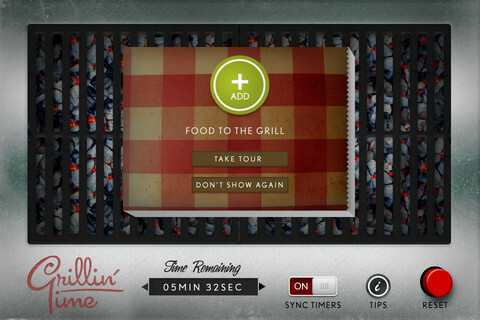 Grillin’ Timeis compatible with iPhone, iPod touch, and iPad. Requires iOS 4.0 or later. A small expedite fee was paid by the developer to speed up the publication of this iPhone app review.